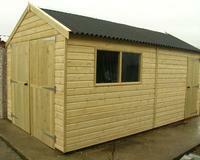 All Timber Garages Supplied And Erected, Are Manufactured To The Highest Standards. 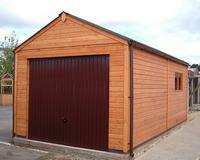 The Quality Of our Timber Garages Is Second To None And With Proper Care And Maintenance Can Last For Years. 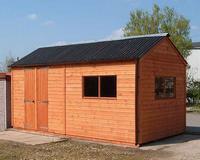 Garages Should Be Sited On A Level Solid Concrete Base Which Must Be Prepared By The Customer Before Delivery. It Is Also The Customers Own Responsibility To Put A Concrete Seal On The Inside Of The Garage. Maintenance Free Black Onduline Roof Sheets. Door Fitted With Rimlock As Standard. 1 x Set Of Windows Included In The Price. 1 x Set Of Timber Swing Doors 7’ft Or 8’ft Wide Subject To Width Of Garage. 75mm x 47mm Quality Softwood Framework Throughout. Roof Purlins 100mm x 47mm. 120mm x 15mm Finished Pressure Treated Tongued & Grooved Shiplap To Walls. 2 x Sets Of Fixed Windows Included In The Price. 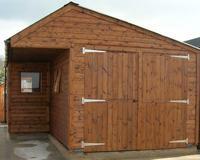 2 x Sets Of Timber Swing Doors 8’ft (2.4m) Wide Subject To Width Of Garage. Double Garages Come With An Overhang But Include Guttering To Both Sides.